Babblings of a Mommy: ThredUP Back-To-School Giveaway!! I can't believe summer is almost over. It feels like Arianna just left Kindergarten! Nonetheless, kiddies are heading back to school soon and like any parent you're probably in the midst of making back to school preparations, including the dread and often pricey clothes shopping. Well, thredUP is here to make your life a little easier this semester. You see, thredUP is an online kids consignment shop where you can save money (and time!) on all your favorite children's clothing brands. You'll find GAP, Gymboree, Mini Boden, Ralph Lauren and much more at up to 75% off retail prices! Which is great because we all know how fast kids grown in and out of clothes. Their clothing is hand-selected by quality assurance specialists, packaged with care and sent right to your door. You can even earn some cash by ordering a thredUP bag and reselling your own quality outgrown items for 20%-40% of each item's resale value! 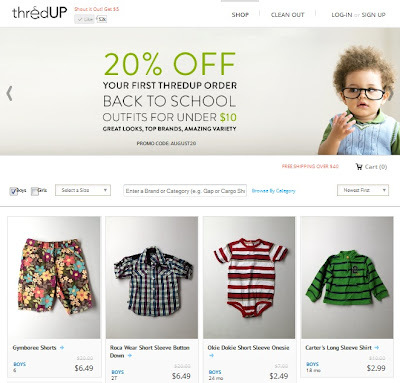 So what does thredUP want to offer you for your Back-To-School plans? 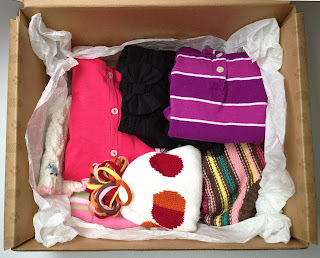 • A personal kids' style consultation with Carly Fauth, Chief Mom at thredUP! • $50 box of clothing hand selected by Carly based on the style consultation. Follow Babblings of a Mommy on Facebook, then leave me a comment here telling me entered. Make sure you leave me your email address in comment. Remember each one counts as a different entry so be sure to enter them separately. You may tweet once a day if you'd like, but be sure to leave comment on post about your re-tweets. Giveaway ends August 28th . A winner will be selected by random.org and will be notified via email. UPDATE: Congratulations to Madeline Brubake, you're the winner! I'll contact you shortly. I already like babblingsofamommy on FB. I follow Babblings of a Mommy on Facebook (FB name: Madeline Brubaker). I follow thredUP on Twitter (@shala_darkstone). I already follow your blog publicly via Google Friend Connect as shala_darkstone. I am now subscribing to your feed.